In the past, “eco-friendly” terminology in food packaging meant limited options and a sacrifice in package performance. Today, environmentally friendly food packaging and proper disposal is a household obligation. Some communities are going so far as to enforce environmentally friendly packaging through civic lawfulness for retail establishments. As the industry reacts to the current market fury of eco-friendly paper straws to takeout packaging, customers are becoming increasingly demanding of biodegradable packaging solutions. Fineline Settings new Conserveware product line empowers customers to offer environmentally friend ly food packaging without dipping into store profit margins and allowing operators to stay focused on their product brand and customer satisfaction. Conserveware containers are constructed using Bagasse, the hardy sugar cane fiber material which is grease resistant and heat tolerant making it more durable and still fully biodegradable. Fineline Settings offers a full line of Conserveware containers ranging from bowls, portion cups, plates, trays and even hinged containers. Each product line has PETE lids available to allow for seamless transition from eatery to table or for those on-the-go transports essential for today’s hectic routines. Fineline’s new eco-friendly containers are able to withstand the hardships placed on take out containers that include slicing, sawing, scooping and even piercing. 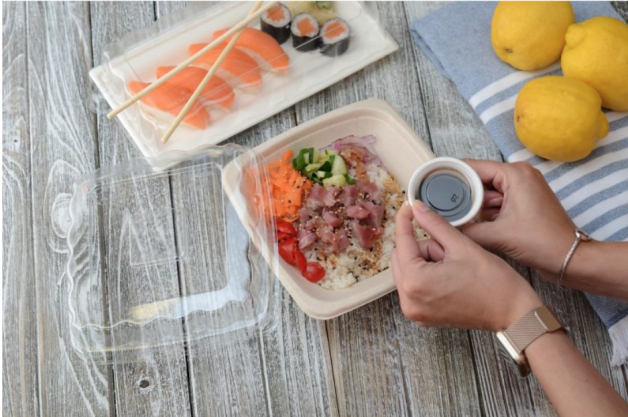 While the future of the Conserveware product line will include specialty product containers to meet the demands of the trendy and stylish food presentations; Fineline Settings is committed to creating innovative packaging in this category to meet every food service need. As typical of Fineline Settings attention to detail, Conserveware product lines are complete families of products that allow you the versatility requested. food service industry. Through unparalleled levels of customer service and prudent operational strategies and logistics of multiple distribution facilities, Fineline has become an industry food packaging leader. Fineline Settings is confident consumers will enjoy the elegant and sophisticated approach to food presentation and transport while the industry will appreciate the convenience and affordability that encourages the creative spirit of food service professionals.